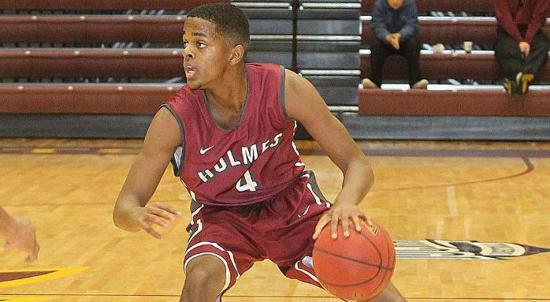 Arkansas added one of the top guards in the 2016 JC class today with a commitment from Holmes CC combo guard Daryl Macon. Macon, a Little Rock, AR native, has been high on Arkansas for some time now and shut things down early by giving them a commitment today. Macon is a 6’2 guard who can score the ball in a variety of ways. He has excellent pre-dribble footwork on the perimeter and is very tough to defend. Macon has the ability to knock down threes with range off the dribble, off the catch and can use a series of jab steps to create space and get his shot off. Players who can consistently knock down shots from the perimeter, but also get to the rim, are hard to come by and the Razorbacks did an excellent job of locking him in early. He is one of the best shooters/scorers in the 2016 JC class and if he continues to add strength he should definitely be an impact player upon arrival. Macon also handles the ball very well and can play the point. He can handle full court pressure and is very tough to defend because he can score off ball screens and distribute from the PG spot. Macon was a First-Team NJCAA D1 All-American and Regional Player of the Year as a freshman at Holmes. He helped guide Holmes to an NJCAA D1 National Tournament berth in Hutchinson, KS. He averaged 23 points, 4 rebounds and 3 assists per game as a freshman. Macon chose Arkansas over Ole Miss, UMass & Memphis. He also had recent interest from Kentucky, Alabama, Oklahoma State and Kansas State.